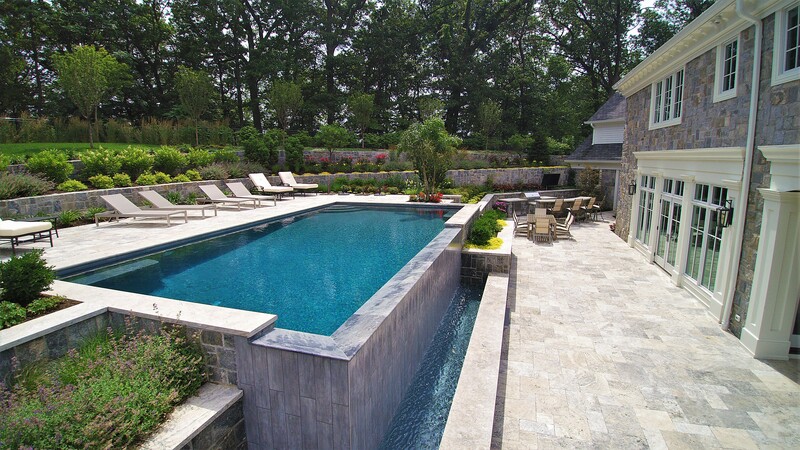 Modern infinity pool design with beautiful pool landscaping, retaining walls, stone stairways and ample patio space. Outdoor pool house and kitchen area, with clean lines and a grey and white color theme throughout. This beautifully modern backyard design has clean lines, white and grey tones, marble, natural materials, and captures an overall sleek and luxury feel. The infinity edge of the pool provides stunning views from any vantage point of the homeowners windows. A large Palm Tree was brought in to be a focal point in the upper patio level. With spacious patios, stairways, outdoor kitchen and lush landscaping, this backyard is sure to impress all who get to enjoy.